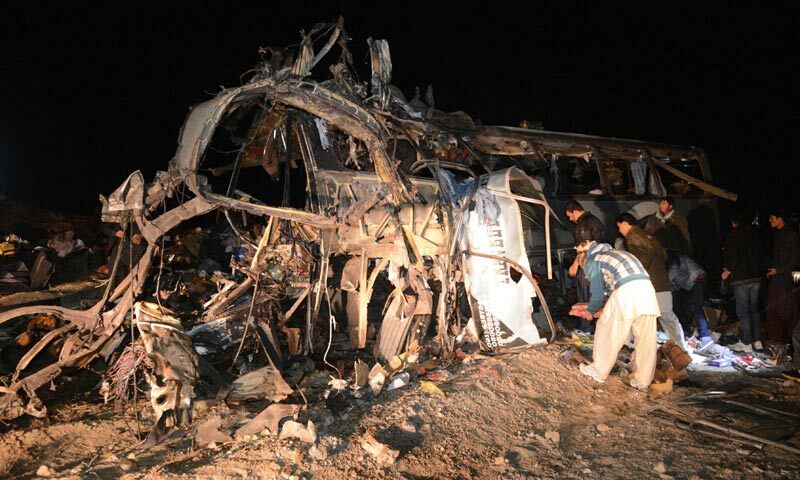 JNN 22 Jan 2014 Quetta : Twenty-Four Shiite pilgrims returning from Iran were Martyred and 40 others wounded when a bomb hit a bus on Tuesday evening near Dareen Garh area of Mastung, in the southwest Pakistan province of Baluchistan. The attack took place at Dringhar village on the Pakistan-Iran highway some 60 kilometres west of Quetta, Baluchistan’s capital. The two buses were carrying 103 pilgrims, including women and children, who were returning from Iran. Severe firing is reported to have taken place following the blast. Soon after the blast, security officials cordoned off the area. “At least 24 people were killed and 40 others were wounded,” local government official Shafqat Shahwani said. He said 51 passengers had been on board at the time of the blast and that nine passengers were still unaccounted for. Provincial home secretary Asad Gilani said it was not immediately clear what type of bomb was used or whether it was a suicide attack. He said that two buses had been travelling together with security vehicles provided by the government and that the bomb struck one of the buses. Shahwani said that bomb disposal officials suspect the bomb was planted on the roadside and detonated remotely, but he did not rule out the possibility of a suicide attack. He added that the driver of the bus told authorities that he did not see any car hitting his vehicle, but felt a sudden blast followed by the cries of women and children amid the destruction. “We have declared an emergency at hospital and doctors and paramedics are trying to save the wounded,” Shahwani said. “I saw at least ten dead bodies and many injured lying in a pool of blood. The bus caught fire after the explosion,” said Arif, who sustained injuries in the attack. Till the Filling of this Report it could not be ascertained by the LEAs that whether Did the Suicide Bomber Hit the Bus from Out Side , or have some how Managed to Infiltrate in the Bus , But the Bomb Disposal Squad has given their report and have confirmed that atleast 100Kg Explosive was used in the Attack , Due to which the Bus was completely Destroyed. Pakistani President Mamnoon Hussain and Prime Minister Nawaz Sharif strongly condemned the bombing in separate messages. Two people were killed in a similar attack on January 1 when a bomb targeted a bus carrying Shiite pilgrims near Quetta. While the Lashkar e Jhangvi have claimed the responsibility of the Attack , which is an Associate of Sipah e Sahaba Pakistan and an Off Shoot Organization of Tehrik e Taliban Pakistan. Shiites make up around 25 per cent of Pakistan’s population, which is largely Sunni Muslim. Oil and gas-rich Baluchistan has been badly hit by a decade-long Baluch separatist insurgency and sectarian violence, mainly targeting Shiite Muslims from the Hazara ethnic community. A large number of Shia pilgrims go to Iran to visit the sacred places through Quetta and most of them travel on passenger buses. Majlis Wahdat-e-Muslimeen , Shia Ulema Council & Hazara Democratic Party has declared three days of mourning for the victims of the blast. All Shia parties condemned the terrorist attack and demanded immediate military operation to eliminate the terrorists. While the HDP have also given a Call for a Shutter Down Strike in the Quetta City for Wednesday. Earlier, on January 1, a bomb blast targeted Shia pilgrims’ bus carrying Shia pilgrims from Taftan, a town in Balochistan bordering with Iran. The blast had killed two people and left 31 injured. Similarly, in October 2013, A car bomb hit a Frontier Corps (FC) van escorting a bus of Shia pilgrims in Dringarh, Mastung, killing two soldiers. Frontier Corps and Balochistan Levies convoys were escorting five passenger buses of Shia pilgrims on the highway when they found a suspected car parked on the road. Two huge bomb attacks in Quetta in January and February last year targeting Shiites from the Hazara ethnic community killed nearly 200 people. As a Day Earlier Pakistan Army and Air force in their Coordinated efforts against the Terrorists have taken action against the Talibans Terrorist Hide outs in Mir Ali , situated in the North Waziristan , FATA , which claimed Killing of atleast 40 Terrorist in the attack , which shows the commitment of the Armed forces to cleanse the Country from the Taliban Terrorist , but some Politicians who are Wolf in the Sheeps Clothing are still trying to Protect the Taliban and their allied Terrorist Group , and instead of Backing up the Armed Forces of Pakistan in taking such Bold steps , in eliminating the terrorism from the Country , rather are showing their reservations on such Actions of the Armed Forces ,by siding with Taliban and adopting their perspective , and are issuing statements such as that the casualty figures include Women and Children , while the ISPR have clearly stated that there were no Civilian Casualty in the Operation in Mir Ali , North Waziristan. But Now the Politician Like Imran Khan (PTI) , Munawar Hassan (JI) , Fazal ur Rehman (JUI-F) , all have been completely exposed as they on the orders of their Foreign Masters , are doing Politics on Behalf of the Taliban , and they Not Only have a Soft Corner for the Traitors of Pakistan , the Taliban , but rather they are the Local Political Sponsors of Traitors of Pakistan , the Taliban. This entry was posted in Asia Pacific, Pakistan News and tagged Injured, iran, Lashkar-e-Jhangvi, Martyred, Mastung, pakistan, Quetta, Quetta City, Shia Pilgrims, Suicide attack, Tehrik e Taliban Pakistan TTP, TTP. Bookmark the permalink.